Found this on @Jason_Igwe_Njoku’s blog. Earlier this year, Zuckerberg opened the messenger platform to developers to create bots. I happened across Fowotade Babajide a young 23-year old Yaba-based developer who created NairaBot. (formerly known as FXbot) He created v1.0 in a couple of nights whilst working a full time gig. I am obsessed with FX (as many are today) and I begged him to be part of his beta testing group. He let me in. We actually met in Mark’s office in Yaba last week, Thursday. We shared the same vision for messaging as an OS. He just had the mad skills to actually go and build and get it approved by Facebook. Funding? He did it for less than N100k. There is less of a linear business model here and it definitely violates a fundamental rule of revenue at Spark. But this is a swing into a distant future. A future we need to get busy building today. We are the most mobilised. So let’s embrace this bot paradigm and build solutions for Nigerians who embraced the OS and will most likely never use a desktop. Introducing Jihdeh’s Nairabot. A primitive but awesome way to get daily FX price updates. All in messenger. There are 18m people on Facebook in Nigeria. The future. Love this post (like I do pretty much all of Jason’s). This segues very nicely with a post I’ve been (slowly) writing about building products that are tailored to high-delta markets (as my friend Jeremy Kirshbaum likes to call them). That is, instead of bundling countries geographically and importing “one model to rule them all” from SV. There’s a lot of Brownian activity going on since we’ve come to the end of the mobile wave (hint: Apple and Google won) and we’re at the fold between two hills. The only thing certain is that the next big platform will either be built directly on (the sheer scale of) mobile (AI [ML], Messenger bots [NLP], or the intersection of many of those things), or take advantage of the fact that mobile smartphones parts are now cheaper (VR headsets, HMDs, Wearable tech, etc.) - economics of scale and all. I’m not a fan of what I call linear, incremental thinking. That is, taking things that exist right now, and using them to draw up models of what the future “will” look like. That’s because many things can happen in the next few years to completely change the landscape (aside: I think the future is made up of a clash of ideas, not extensions of existing ones). …is akin to going back in time to 2002 and showing someone an Xbox One console. They’d get super-excited about it and term it “futuristic”, but it does not paint a wholesome picture of what the future (today) looks like. In all, I’m excited about the future and what that phrase turns out to mean in say…10 years. Messenger bots may be it (because Africans largely already drink the web through a straw - WhatsApp, Facebook, Nairaland, and Linda Ikeji’s comments section are all social networks, e-commerce sites, Wikipedias, etc. ), or they may not. I’m sticking around to find out. 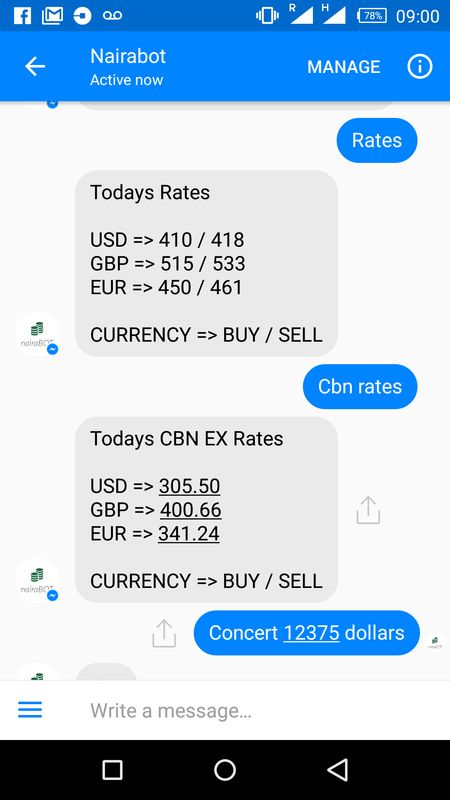 Itching to see what other interesting things the Nigerian developer space can do with bots. ML& NLP are subsets of AI. I know that, but thanks. I put them in square brackets so people knew what I was referring to even though they may not be familiar with either ML or NLP. Here is the source code so that anyone can tinker and play with it and see how the bot was created. I wish you the best. Life bless.